Living in an apartment does have its perks, it often leaves me wish I had my own place that I actually owned so I could make all the changes I wanted to and not feel like i was wasting my money. One of those things is kitchen cabinets. I know I'm not alone in this either, because apartment kitchen cabinets are usually less than desirable and not super functional. WTF- gotta love that huge panel the landlord needed to cut in the back too- so pretty. A disaster to say the least. But, without knowing how much longer we are going to be in our apartment I was not about to go out to the Container Store or Home Depot and spend money on upgrades for cabinets I dont own. or this one, since Martha does everything perfect. Getting my cabinet in order without spending money seemed imposable. While at my parents house last week I went downstairs to my Dads wood shop and gathered 3 pieces of wood from his scrap pile. They just happened to be the perfect size for my cabinet. Once I had the cabinet empty I slid in my new shelf and ﻿then put everything back all neat and organized FINALLY! So happy that my cutting boards have a place to slide in, the cookie sheets are right next to them, and the pots and pans are all organized on the wood shelf AND a shelf riser in the back. With everything organized it made me want to cook! Come back later this week to see what I whipped up. Great idea - I have got to do something simple like this for my bathroom cabinets, too! It's a mess in there. And I absolutely love the wooden cabinet organizer in your first photo! Where did you find that? Elisa- I totally forget where I found it, I've had it saved for awhile and was a bad blogger and forgot to note where I got it from- so sorry! Not only are you talented, but you are handy too! Such a smart idea! I used to live in an apartment and the older cabinets were such a bear, but I agree - it's hard to dump $$$ into a temporary space. 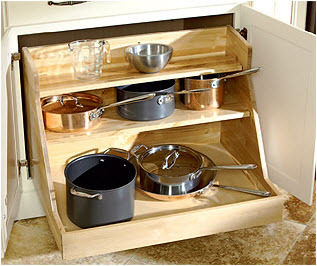 This is a really creative idea to maximize space ... and cost-efficient! 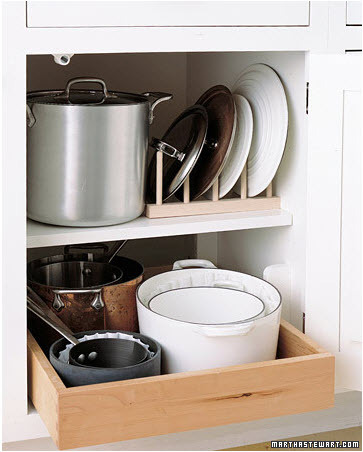 Super idea - love spending little or nothing at all to organize. I needed to reorganize my linen/utility closet last week; refused to spend a dollar. I found baskets and containers around the house and re-purposed them in the closet. Everything is edited and in its place, etc. when i ordered my cabinets i ordeded my bottom cabinets to have draws and so forth - but this is a GREAT cost effective way of doing it - i wish i sorta' saved my pennies - i think i went a lil overboard in my reno! what a fabulous idea!! I need this for my kitchen - thank you for sharing!! this is a great idea! my pots/pan situation is embarrassing. You always have such great ideas!! Very handy!